Business executives are a busy bunch. It’s challenging to balance the demands of work and family while still having time for activities like sports, hobbies or friends. Even so, many business leaders make it a priority to carve out time for the causes that are important to them. Some, like tennis legend Chris Evert or football Hall of Famer Dan Marino, use their notoriety to make a big splash with their charitable efforts. Others, like the five South Floridians we feature here, perform their good work in a more subtle — yet every bit as meaningful — manner. Some invest time; others, money. Each has different skills, experience and talent, but all share one important quality: they believe in using their powers for good. Jewish Adoption and Foster Care Options. The Young At Art Museum. Women In Distress. The Prestige Club. The Broward Public Library Foundation. The American Cancer Society. The Jewish National Fund. Broward 2-1-1. The list goes on; indeed, it’s a veritable “Who’s Who” of local and national organizations that have been supported by Tracey and Ed Dikes. 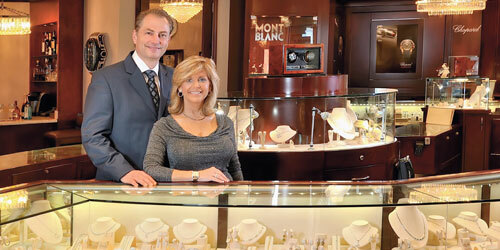 Tracey and Ed opened Weston Jewelers 12 years ago and have been committed to supporting both local and national charities from day one. They estimate that they have raised or contributed “hundreds of thousands of dollars” to charities through the years. Sometimes the Dikes donate a piece of jewelry to be auctioned off by an organization; other times they may host an event in the store and donate a portion of the proceeds back to the organization. They receive approximately 60 requests a month from organizations seeking their support. Lisa Learn has been involved in volunteer work since she was a child; her parents got her involved with the church when she was a young girl. But it wasn’t until she was an adult and practicing medicine that she really found her calling and devotion to charitable endeavors. After practicing for 11 years in Ephrata, Pa., Learn relocated to South Florida and quickly earned a reputation for her involvement with local charities. She was a 2013 “Man & Woman of the Year” candidate for the Southern Florida chapter of the Leukemia & Lymphoma Society and a founding member of the Starfish Circle for Women In Distress. Learn also donates her time to provide breast reconstruction to low-income women who lack medical insurance. Stephen Moss may be a real estate attorney and a partner with Holland & Knight in Fort Lauderdale. But the Army veteran, who joined ROTC in college and then served as a company commander in Vietnam between 1969 and 1970, is a military man at heart. That’s why he’s so proud to be the Chairman of the Advisory Committee of Mission United, a new collaboration between the United Way of Broward County and the American Red Cross that supports U.S. military service members, veterans and their families in Broward County by helping them re-acclimate to civilian life. The cause is also near and dear to Moss’s heart because his daughter, Shannon Green, is a veteran as well. She followed in her dad’s footsteps, joined the Army and served in the military police in Iraq for almost a year, convoying escorts of military supplies and equipment and protecting dignitaries. After getting wounded, Green had to give up her dream of a career in law enforcement, but she is graduating from college in December and studying emergency management. “We’re very proud of her,” Moss says. In addition to serving the community himself, as a partner in a respected law firm Moss also encourages his employees to support local charitable organizations. Associates are expected to do at least 100 hours of pro bono legal work every year; partners, 50. In addition, every lawyer except for first-year associates is expected to get involved in the community in some way. Former linebacker John Offerdahl is well known for his exploits on the football field. In fact, on Oct. 31, during halftime of the Miami Dolphins’ game against the Cincinnati Bengals, he will be inducted into the exclusive Dolphin Honor Roll. Offerdahl is also well known for his exploits in the kitchen. In 1990, while still a pro football player, he and his wife, Lynn, launched Offerdahl’s Bagel Gourmet, which ultimately grew to 10 stores before Offerdahl retired from both football and bagels in 1995. Five years later, he founded Offerdahl’s Café Grill, a fast-casual restaurant featuring steak, chicken and salmon as well as salads and bakery items. But what people may not realize is how active Offerdahl is behind the scenes with a number of charities that are important to him — despite the fact that he won the Nat Moore Community Service Award, bestowed by the Miami Dolphins for involvement in the South Florida community, in 1989, 1990 and 1993. On Nov. 9, Offerdahl will host the John Offerdahl Broward Health Gridiron Grill-Off Food, Wine & Tailgate Festival from 1 p.m. to 10 p.m. at the Pompano Beach Amphitheater. This fourth annual culinary showdown will pair Miami Dolphins legends with some of South Florida’s top chefs to prepare signature dishes. It also includes the Jack Daniel’s Tennessee Honey Tailgate Zone, live music and South Florida’s first EGGfest for “Big Green Egg” barbecue enthusiasts. Offerdahl is hoping to raise $50,000 at the event, benefitting his Hand-Off Foundation, which directs funds to agencies that “feed the needs of kids in crisis,” including 4KIDS of South Florida, HOPE South Florida, Here’s Help, the Florida Restaurant & Lodging Association and the Miami Dolphins Foundation.